& EQUIPMENT SUPPLIER TAP & WASH PAYMENT Now Here! NOW HERE! 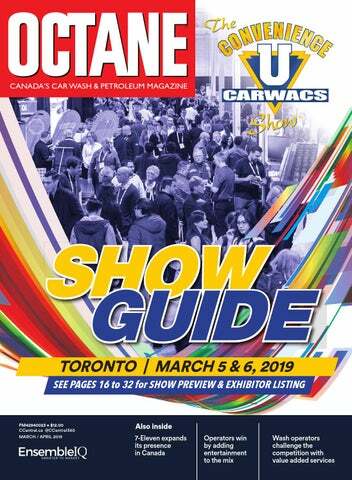 16	The Convenience U CARWACS Show Guide Toronto | March 5-6, 2019 Preview and exhibitor listings 34	Featured Products New products & equipment featured at the Toronto show 36	CCA Industry Forum Looking to sell or buy a carwash? The love of all things hockey Breakaway from the crowd. Introducing Canadaâ&#x20AC;&#x2122;s newest gas and retail brand, Breakaway. Backed by quality fuel, trusted delivery, and a respected convenience offer. great opportunity Are you ready for the industry’s main event? Toronto’s Convenience U CARWACS Show is Canada’s largest industry gathering for all things convenience, forecourt and car wash. Here are five tips to help make the most of this remarkable networking opportunity. Be prepared: Do your homework well in advance. Attendees should look over the booth listings and circle those exhibitors they want to see. Then drop them a quick e-mail to let them know you are coming. If you have a new product or service, send out e-mails a month before the show to generate interest and use social media to push the envelope further. Maximize your booth time: Create an in-house shared calendar so that those at the stand can tell attendees when various sales and marketing people will be at the booth. Schedule as many meetings as possible beforehand and work to increase the number of interactions from previous years at the show. Come early and leave late: The booth team should be on deck 30 minutes before the trading floor opens. This is a good time to discuss battle plans and iron out any kinks with displays, scanners, or other technology. At the end of each day traffic often slows and this is a time when people are less harried with the busy atmosphere of the show. Use this time as an opportunity to speak at greater length with attendees. Attend the networking events: The Convenience U CARWACS Show offers numerous occasions for casual gathering with awards ceremonies, games, break out sessions, and industry tours as well as luncheons and breakfasts. This is where business relationships are made and new contacts are discovered. Plan to work the room and meet as many people as possible. The settings are casual, but the intent is serious business. Follow up: You’ve made good contacts and had meaningful interactions at the show. Don’t let these opportunities fade. Reach out to people who took the time to visit your stand and say thanks as well as carry through on conversations about future business. Use social media to tell your network about your success at the show and include photos. 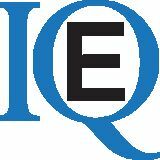 LICENSING AND REPRINTS Please contact Wright’s Media | ensembleiq@wrightsmedia.com 1-877-652-5295 CONVENIENCE STORE NEWS CANADA / OCTANE is published 6 times a year by EnsembleIQ. CONVENIENCE STORE NEWS CANADA / OCTANE is circulated to managers, buyers and professionals working in Canada’s convenience, gas and wash channel. Please direct inquiries to the editorial offices. Contributions of articles, photographs and industry information are welcome, but cannot be acknowledged or returned. ©2019 All rights reserved. No part of this publication may be reproduced in any form, including photocopying and electronic retrieval/retransmission, without the permission of the publisher. coloured foams, and twinkling lights and themed secondary services such as a ’50s-style soda counter. “Be creative, be different, you and only you know the location/market conditions of your wash facility. Have fun with it and make it fun for the consumers,” he says, adding that at the minimum the site offered music playing in the background, tri-colour foam brush and foam wax as well as pleasant scents in wash chemicals, and friendly interactive staff. US example points to power in partnerships. Will we see this level of team play in Canada? In the US, Northfield Park, Ohio, operator RockStop Gas & Wash is offering the ‘Vegas’ experience to its gas and fuel customers. The site, located about 30 kilometres between Akron and Cleveland, has partnered with the Hard Rock brand and offers a casino (Rocksino) and entertainment complex adjacent to its car wash, forecourt and c-store. The forecourt features Hard Rock-style lighting effects and LED TVs, which broadcast music videos and commercials. RockStop also delivers entertainment with a car wash with soundtracks for guests to enjoy and a full retail store including limited edition Hard Rock merchandise. RockStop also utilizes coloured foams, fruity scents and hard-driving tunes to keep customers thinking about the total experience available at the location, which is Ohio’s number one gaming destination. now drop in during the evening for our Twilight Laser Wash, grab a quick bite and maybe wash the dog all at the same time. It’s a package where all the pieces fit together in a community where this is something new. It’s a small market and we took a bit if risk with the investment, but it’s paying off with customer support. that generates excitement with a holistic approach to engage the senses. “When your wash site offers something amazing, people put this on social media and this drives business and loyalty within the younger demographic,” says TSS vice-president Bobby Jones. “There is so much disruption in the market, operators need an edge to stay in the game." Upping the entertainment factor with new FX arches from MacNeil Wash Systems. Making a big splash Industry reports show that customers spend on average more than $50 per vehicle for lube service, and sites see around 1,200 jobs per month at multidoor operations. Typically, lube and glass operations are tied to detail and hand wash centres where customers expect to leave vehicles for care. Splashes in Whiterock, B.C. has exceeded customer expectations with a slate of five services to complement their WhiteWater car wash, a site custom built and patented by Splashes. The wash is a flat deck conveyor-fed touchless system that uses robotic profiling to maximize clean on vehicle surfaces. The facility, owned and operated by Greg Horton and Ryan Oliver, opened in 2008. According to Splashes manager Saskia Goodacre, autoglass is their most profitable service. The site offers window tinting as well as a full windshield replacement and repair service. “We are located in the South Surrey Automall, and as such we have good exposure to new and used car buyers, and we do work for the dealers in the mall,” she says, noting that the close proximity to dealer service centres had them decide not to offer oil change. Splashes' list of services includes Armaguard protective coatings and packages such as rust protection and undercoating, windshield tinting and full autoglass repair, the X-Kote paint renewal system as well as their tunnel wash and full detailing service. They also sell and install car bras, roof racks and cargo boxes. Goodacre reports that the range of services has seen the business grow steadily. “Five years ago, we had about 20 people on staff. Today we have 40,” she says, remarking that the business is very labour-intensive. This January OCTANE got together with Doug Rosencrans, vice president & general manager, 7-Eleven Canada, to ask about the company’s continuing drive toward leadership in Canada’s c-gas market. Operating in Canada since 1969, 7-Eleven today boasts more than 640 convenience and gas sites in Canada. They have also become a major player in forecourt following Imperial Oil’s recent divestiture of its ESSO retail network. renovations and introduced new programs like Slurpee, hot food, roller grill, bakery, and an expanded assortment of Better-For-You, snacks, confectionery and other items. We recently upgraded the fuel point-ofsale system in all ESSO locations and we are near completion adding the Synergy imaging. In all our brands we continue to upgrade dispensers and digital signage as we work towards improving the customer experience.
" With provinces setting timelines for zero emissions, convenience retailers need to start planning for a future with greater alternative retail fuel options "
We continue to invest in new car wash equipment and we are adding a car wash payment terminal to allow customers to conveniently purchase a car wash while in their vehicle. We will soon be upgrading our branding on our existing car wash locations. While most Canadian c-gas retailers have gone with ApplePay and traditional card services for pay-atpump, we saw that 7-Eleven has gone with Alipay and WeChat as platforms. What are the benefits here? At 7-Eleven, we’re always looking to improve convenience for our customers, and this includes offering mobile payment solutions. These systems will help customers – residents and tourists – complete transactions in an easy and familiar way. Alipay and WeChat Pay help enhance our customer experience. We’re the first convenience retailer in Canada to provide Alipay and We Chat Pay payment solutions, and we’re well positioned to continue to drive digital transformation with the latest in consumer-facing mobile technology.
" We’re the first convenience retailer in Canada to provide Alipay and We Chat Pay payment solutions, and we’re well positioned to continue to drive digital transformation with the latest in consumer-facing mobile technology. " In November, we read about a new positive environmental initiative – RENEW. How will initiatives such as this benefit site holders? As we look to the future and study what our customers expect from us as a brand, we will continue to expand our environmental best practices and promote green initiatives like the 7-Eleven RENEW Emissions Offset Program. 7-Eleven RENEW is a North American program that we are testing at sites in Greater Vancouver, with support from our fuel partners, Petro-Canada and ESSO. It is also being tested in several western markets in the U.S. Every time a customer fills up, the RENEW program plants trees in our local communities and invests in carbon emissions offset projects like reforestation, solar and wind power, and more to offset tailpipe emissions by up to 30 per cent. Our goal is to plant as many as 20,000 trees through Tree Canada and other local non-profit partners. Since September 2018, the program has supported 3,200 trees, with 2,500 now in the ground based on planting schedules. Insightful presentations and networking opportunities are just the starting point at this year’s Toronto Convenience U CARWACS Show. Expect to be inspired and enlivened with much to see, more to do and even more exciting opportunities to enliven your business at the 16th annual Convenience U CARWACS Show. General Meeting and luncheon. Both members and non-members are invited to register and attend this event. DAY 2 (MARCH 6): DAY 2 sessions start with Cannabis is now legal. So, what now?. Speaker Gail Green will deliver the HR goods with Hiring the right people for the right job. Next, join George Anastasopoulos for A great workplace culture is good for your business. Day 2 also features the CARWACS Carwash Tour. Buses leave Toronto Congress Centre at 8:30 a.m. and return at noon for the CCA-hosted luncheon. MORE BUSINESS: 7KHWUDGHVKRZŴRRULVRSHQ daily from noon till 5 p.m.
MORE EXHIBITORS: The show has grown. Opening each afternoon, the show attracts hundreds of returning and new exhibitors. Bring your questions and plan to discover the latest in new products. A. Lassonde Inc is Canada's own premier beverage solution provider in both branded and private label, with 100 years in business. We are proud of our great brands, such as Oasis, Allen's, Rougemont, Fruity, and many more. #1 ATM provider in Canada with a nationwide network of over 9.000 ATMs covering all provinces and territories. Access Cash has the best team of dedicated ATM professionals with superior reputation for customer service and support. Conserve energy. Preserve your hearing. Aerodry manufactures reliable and effective drying systems for all types, brands, and sizes of washes. See and hear the difference! $,5VHUYLVWKHZRUOGOHDGHULQSURYLGLQJWLUHLQÅ´DWRUHTXLSPHQW and services to the retail petroleum industry. We supply, install & maintain at no cost to you. $06KHOYLQJGHVLJQVDQGPDQXIDFWXUHVVWRUHÆ&#x201C;[WXUHVDQGVROXWLRQV for c-store, gas bar, and specialty retailers. At Atlantic Prepaid, we provide more than just gift cards. We partner with businesses across Canada to offer a customized prepaid proJUDPWKDWZLOOGULYHFRQVXPHUWUDIÆ&#x201C;FWR\RXUVWRUHZKLOHSURYLGLQJ you with exceptional retailer support. AUTEC manufactures three primary car wash systems for gas and groceries: soft touch, touch free, and a combination system that provides both. AUTEC also manufactures a soft touch polisher. Bell offers Canada's fastest ranked internet to help businesses do more and make more. %UDQGRZQHURI7KH3RS6KRSSH	H[FOXVLYH&DQDGLDQĆ&#x201C;UVWLPSRUWHU of Alo, Calypso and Savani brands. Strategic alliance partnership with Faygo Beverages and Arizona Beverage. Big Brands offers a full selection of brand name trial and travel consumer goods packaged in our patented gravity pack merchandising system. Bon Appetit is a world-class artisan quality pastry company offering ODUJH'DQLVKHVPXIĆ&#x201C;QVDQGFDNHVLQVLQJOHVHUYHDVZHOODVSDFNDJH pastry to the convenience store channel. Healthy "better-for-you" confectionery and snacking foods COCO5, &OLI%DU.HWWOH&KLSV*+&UHWRUV3RS&RUQHUV7KLQN%DU%HDQĆ&#x201C;HOGV and more. Come visit the frozen beverage experts for quality products, service and insight. Also see the newest innovation in frozen beverage dispensing - The Fresh Blender. When dependability counts. For more than 25 years, we have been a leader in the petroleum point-of-sale market. From one to a thousand sites, we can meet your needs. &DOLĆ&#x201C;D)DUPVDSSOLHVFUHDWLYLW\DQGLQQRYDWLRQWRFUDIWDZLGHDVVRUWPHQWRIGHOLFLRXVSODQWEDVHG products including plant milks, dairy-free creamers and cold brew coffees. Dedicated to the responsible growth and prosperity of the Canadian car wash industry. CTH has been developing concepts, products and sourcing products to provide solutions for customers for over 23 years. We offer complete importation, distribution and sales functions from plant to consumer. With nearly 40 years of experience and unmatched reputation in importing and distributing food SURGXFWVIURPWKH3DFLĆ&#x201C;F5LPDQGRWKHUUHJLRQVRIWKHZRUOG&DQGD6L[)RUWXQH(QWHUSULVH&R/WGKDV positioned itself as a reliable and dependable supplier of Asian foods to the mainstream and ethnic oriental markets in Canada. Cantest Group of companies provides quality services for the petroleum market with expertise in meter calibration, leak detection, smart security, SaaS, and more. Cardtronics is Canada's largest, most capable ATM operator. We bring together unmatched global scale with local service and support to provide Canadian businesses with the best available ATM solutions. Casa Cubana - Spike Marks National Distributor Brands: OCBâ&#x201E;˘, Primacâ&#x201E;˘, Vapurâ&#x201E;˘, Odor-Ableâ&#x201E;˘, Bullseyeâ&#x201E;˘, Primetimeâ&#x201E;˘, Canperâ&#x201E;˘, Slickâ&#x201E;˘, Cubita. Ceccato Spa is synonymous with quality, reliability and innovation: with more than 80 years of experience in the car wash industry, it guarantees the best of "Made in Italy" all over the world, now in Canada too. Mobile solutions to automate direct store delivery, route accounting, and merchandising forces, linked to any ERP systems. Magnetic hanging system for banners, signs, balloons and decor. Patented pre-charged, emergency mobile device charger that is actually good for the environment. Instant power at any hour! Chapman's Ice Cream is Canada's largest independent ice cream manufacturer. We use 100% Canadian dairy and produce quality products at affordable prices. Conagra Brands in Canada is one of North Americaâ&#x20AC;&#x2122;s leading branded food companies with iconic and emerging brands, including: Orville RedenbacherÂŽ, VHÂŽ, AylmerÂŽ, BigsÂŽ, Slim JimÂŽ, and DukesÂŽ among many others. OLWUHV We offer petroleum and water tanks, oil water separators and interceptors. Core-Mark is one of the largest broadline, full-service marketers and distributors of packaged consumer products in North America. Core-Mark offers retailers marketing programs in every category: Fresh, Foodservice, General Merchandise, Core Categories, Health & Beauty, and Tobacco. Country Signs provides its clients with a complete project PDQDJHPHQWSDFNDJHIURPVLWHVXUYH\DQGGHVLJQVSHFLĆ&#x201C;FDWLRQVWR installation and maintenance programs across Canada. QSR offering freshly ground coffee, baked goods and MR. SUB sandwiches. WKJHQHUDWLRQIDPLO\IDUP*OXWHQIUHH.RVKHUFHUWLĆ&#x201C;HG$OO Natural. Kettle-cooked potato chips. Kettle-cooked popcorn. Cree believes in better light experiences and delivering new, innovative LED technology that transforms the way people experience light through high-quality interior and exterior LED lighting solutions. Canadian distributor of commercial kitchen equipment. New air refrigeration, Scotsman ice systems, Tecnoeka ovens, Royal Range cooking equipment, Thorinox stainless steel equipment. EMV in Bay. Debit/Credit systems. Car wash entry and control system specialists. Nationwide distributor of brand name consumer packaged goods including health and beauty, household cleaning supplies, over-the-counter medicine, general merchandise, smoking accessories, and confectionery. The leading car wash payment technology and wash monitoring service. Coming to Canada. )&66//LJKWLQJRIIHUVVSHFLĆ&#x201C;FDWLRQJUDGHSURGXFWVDQGVROXWLRQV to owners with industry-leading lighting technology and an exceptional customer experience for 35 years. The leader for time-tested composite piping systems for underground fueling, over 50 years' experience with our Red Threadâ&#x201E;˘ IIA, and Dualoyâ&#x201E;˘ products. With Findoor say goodbye to maintenance hassles and expenses with overhead, bi-fold and sliding doors. Join the revolution with Findoor. The Convenience U CARWACS Show Listing | TORONTO 2019 First China Tobacco Company Ltd 53-55 West Beaver Creek Road Richmond Hill ON L4B 1K5 Canada Phone: 905-762-8838 Fax: 905-762-8839 Toll Free: 1-844-253-6399 Tobacco importer and wholesaler. Double Happiness classic deluxe 20s, Double Happiness 9mg 20s, Double Happiness 6mg 20s, Double Happiness 12mg Gold 20s. blu is a global brand and pioneer in the e-cigarette category. Our mission is to create SOMETHING BETTER for the worldâ&#x20AC;&#x2122;s adult smokers. FSS, Inc. works with operators to optimize their kitchens through our nationwide network of executive chef consultants, leading global equipment brands and the industry's best service and support. Distributor of Scotsman Ice Systems, Amana, LAINOX, APW Wyott and many more brands. Innovative Fiberglass solutions for any project. Franklin Fueling Systems offers the world's most complete line of petroleum equipment including submersible pumping systems, piping and containment systems, service station hardware, dispensing systems, fuel management systems, and transport systems. f'real foods designs, sells, and markets blended frozen beverages in over 20,000 locations across the U.S. and Canada, including convenience stores, military bases, and universities. )XHO0DVWHU6\QWHFK6\VWHPV,QFSURYLGHVIXHODQGĹ´HHWPDQDJHment solutions in real time with cloud-hosted software. Furever Clean Dog Wash is the Canadian distributor for the world leader K9000 Self Serve Dog Wash. Businesses use the dog wash as a way to attract new customers and increase revenue. Oh Snap! Pickling Co is changing the way people think about pickles. Packed with no brine added, they are the perfect snack for any occasion. Grinner's licenses concepts under three brand names (Greco Pizza, Capt Submarine and Frozu! Frozen Yougurt- to be added to convenience stores. Hamilton Manufacturing Corp. 324 1026 Hamilton Dr Holland OH 43528 United States of America Phone: 419-867-4858 / Toll Free: 1-800-837-5561 www.hamiltonmfg.com Hamilton designs, manufactures, and supports innovative kiosk solutions, mobile apps, REID systems and site management software for tunnel, automatic, and self-serve car washes. Health Canada - Tobacco and Vaping Compliance and Enforcement Program 925 2301 Midland Avenue Scarborough ON M1P 4R7 Canada Phone: 416-954-9825 / Fax: 416-954-3655 www.gosmokefree.gc.ca The Tobacco and Vaping Compliance and Enforcement Program is responsible for the administration and enforcement of Tobacco and Vaping Products Act and associated regulations. The Hershey Company is the largest North American manufacturer of quality chocolate, sugar confectionery products and is a leader in snacking innovation. The Hershey Company markets such iconic brands as HERSHEYâ&#x20AC;&#x2122;S, REESE, OH HENRY!, BROOKSIDE, barkTHINS, HERSHEYâ&#x20AC;&#x2122;S KISSES brand, TWIZZLERS, JOLLY RANCHER, ICE BREAKERS and ALLAN. Peanut Roaster and Candy Packager. Great selection of peanuts, nuts, trail mixes and candy for everyone's likes. Looking to co-pack for your needs. OPW, GPI, PMP, Wayne Pumps. House of Horvath is Canada's top choice for cigars. With convenience and premium cigar products from all over the world, there is something for everyone. Manufacturer and technical support of market leading secondary containment sump leak repair & corrosion prevention applications. Igloo Food Equipment is one of the largest showrooms in Canada, selling refrigerated display cases, cooking equipment, smallwares. ,06,GHQWLÆ&#x201C;FDWLRQPXOWLVROXWLRQ  9000, Henri-Bourrasa Ouest Montreal QC H4S 1L5 Canada Phone: 514-336-3213 / Toll Free: 1-888-336-3213 www.imsinc.ca @IMS_Labeling IMS offers labels, shrink sleeve, bar code, scanners, label printers, print - and - apply label applicators and labeling software. IMS helps customers to optimize their packaging line and track all products precisely. We create powerful point-of-sale and fuel management software system for today's competitive retail fueling, convenience store and unattended card lock fueling marketplace. Sun Rype products. Gay Lea products. Rose Packing. Foster Farms Corn Dogs. Gehl Foods Cheese Sauces. White Castle Sliders. Fentimans Craft Sodas. ,QQRYDWLYH&RQWURO6\VWHPVLVGHƓQLQJWKHZRUOGRIFDUZDVKLQJ technology; now offering EMV chip/debit hardware and software solutions for all segments: conveyor, in-bay automatics, and self-service. Invenco is a global leader in EMV outdoor self-service payments. Now Canada can experience Invenco's revolutionary technology solutions used by millions of people every day. JBS Industries® is a leading chemical manufacturer celebrating 40 successful years in the car wash industry. Always innovating. Check out our COMPASS® hyper concentrate line! Johnsonville Sausages will be sampled, both Roller Grill products and Ready to Eat Sausages. Iowa Rotocast Plastics, Inc. offers products including ice-down merchandising solutions, wire racks, electronic refrigeration, and fabricated carts and kiosks for the food and beverage industry. JTI-Macdonald Corp. is a part of JTI (Japan Tobacco International-, a leading international tobacco company. Primary brands in Canada include Export A, Macdonald Special, LD, Studio, Camel, Winston and American Spirit. Since 1950, Istobal has designed, engineered and manufactured vehicle washing equipment with the owner environment and the consumer in mind worldwide. :HVKRSWKHZRUOGWREULQJ\RXWKHƓQHVWDQGPRVWLQQRYDWLYHIRRG products from around the globe. JTI Canada Tech Inc., also a part of JTI, is the importer of Logic Compact and PLOOM TECH. With some of the world’s leading brands, JTI is quickly becoming a global player in the e-cigarette and tobacco vapour categories. Juul Labs was founded with the goal of improving the lives of the world's one billion adult smokers. Your one stop shop for all your carwash needs. Stop by our booth for great show special discounts. Specialty cigarettes. Premium hand rolled cigars/ mass market cigars/ Blunt wraps. Electronic Vapes & liquids. Tobacco accessories humidors. We are dedicated to developing leading-edge rust inhibitors and lubricants/penetrants to help save people money and make their vehicles last longer. Offers full or limited menu, depending on venue size. Gas station/conveniencecstores, airports, mass transit terminals, stadiums, hospitals, universities and shopping destinations. MadeGood snacks are manufactured in a nut-free facility and are free from most common allergens, organic and contain nutrients equivalent to a serving of vegetables. MapArt is Canada's leading distribution house of maps, handbooks, tree-free greeting cards, souvenirs and children's impulse items. Come see our many new brands for 2019! Maple Leaf Foods is a leading consumer protein company in Canada. Our brands serving the convenience trade are Maple Leaf, Schneiders and Shopsys. Global supplier of car wash equipment, service and chemicals with direct operations in Canada. McCowan Design and Manufacturing is Canada's leading supplier of c-store/gas bar food service counters, cash counters, gondola & shelving, forecourt merchandisers, security cabinets, tobacco displays, waste units and signage. Proudly Canadian supplier of crafted jerky & meat snacks. Starting with the best ingredients and cuts of meat our products are then naturally smoked and 100% gluten free. Now the leading manufacturer of chocolate, chewing gum, mints and fruity confections in Canada, Mars Wrigley Confectionery includes iconic brands includes M&M’s®, SKITTLES®, EXCEL®, SNICKERS®, TWIX®, STARBURST® and JUICY FRUIT®. Myle and Ki vaping pod systems presented by Masaru International Sales Inc., a Canadian distributor of vaping products, featuring Canadian made E-Liquid. Mini Melts is a unique frozen dessert! Our pre-packaged ice cream comes in small delicious kernels that you eat with a spoon! Mighty Flame is the leader in propane cylinder exchanges providing superior service and quality. Makers of quality confection, including soft style liquorice, wine gum rolls, soft mints and nougat bars. Distributed in Canada by Warehouse Trading. Mondelez International is well represented in Canada across snacking categories with our many brands, including: Cadbury Dairy Milk, Caramilk, Toblerone, Maynards candy, Halls belVita, OREO, Chips Ahoy!, Peek Freans, Dad’s biscuits, Ritz, Triscuit, Wheat Thins and Premium Plus crackers, Crispers, Bits & Bites snacks, Trident, Dentyne and Stride gum. 0,3HWUR7HDPSURYLGHVUHWDLOLQGXVWU\NQRZOHGJH	VLJQLƓFDQW experience in the petroleum & convenience market. Mondo Products is a Canadian-owned company that manufactures and markets cleaners and equipment to service the car wash industry. 0\VWLFDO'LVWULEXWLQJFRQWLQXHVWREHWKHFRXQWU\ VOHDGHULQƓUHZRUNVLQQRYDWLRQ7KLV\HDUSURXGO\ showcasing their low harm, salt nicotine device, RUSH. Canada's national petroleum commercial equipment distributor, sales and service for industry-leading products and technology. From fuel dispensers and card lock systems to fuel storage and monitoring control systems. NSTC distributes the two top-selling brands of smokeless tobacco in Canada, Copenhagen and Skoal. NSTC continues to offer products that align with evolving adult consumer preferences. Nakd bars are a great way to eat nutritious, healthy food without compromising on taste! Our snack bars are made from all natural ingredients. Nestlé‚ is tremendously excited about our innovation plan for 2019, as part of our ongoing strategy to support our consumer preferred brands - Kit Kat, Drumstick, Haagen-Dazs, and Carnation Breakfast Essentials. We will be pleased to welcome you at our Nestlé‚ Booth to share more exciting details of what’s coming your way in 2019! Specialist in the manufacturing of modular insulated metal panels for walk-in coolers and freezers and building envelope. Northern Dock Systems specializes in sales and service of springless-high speed overhead performance door solutions specially designed for car wash and automotive applications. Nuform Building Technologies Inc specializes in PVC building PDWHULDOVZKLFKIRFXVRQLPSURYLQJFRQVWUXFWLRQHIĆ&#x201C;FLHQF\ SUHPLHUĆ&#x201C;QLVKLQJVZKLOHEHLQJFRVWHIIHFWLYH&RPHYLVLWXVWRVHH our CONFORM, RELINE and RENU products. OLG would like to remind our convenience lottery retailers about the importance of executing our merchandise and POS to the highest standard. Please remember to keep your â&#x20AC;&#x153;Play Areaâ&#x20AC;? and Instant Ticket merchandisers clean and clutter free. For 125 years, OPW has led the way in designing and manufacturLQJZRUOGFODVVUHWDLOIXHOLQJĹ´XLGKDQGOLQJDQGFDUZDVKV\VWHP VROXWLRQVIRUWKHVDIHDQGHIĆ&#x201C;FLHQWKDQGOLQJDQGGLVWULEXWLRQRI IXHOVDQGFULWLFDOĹ´XLGV7ROHDUQPRUHDERXW23:Ĺ?V\HDUVRI providing industry-leading solutions, visit us at our booth or see our website above. Complete line of touch-free and soft touch in-bay automatics. Learn about our "My Wash Buy Up" technology! P.D. McLaren Limited 135, 138 #41 - 110 Scotia Court Whitby ON L1N 8Y7 Canada Phone: 905-428-8403 / Fax: 905-579-7444 www.pdmclaren.com &RPPHUFLDOĹ´HHWUHIXHOHUVDQGIXHOPDQDJHPHQWV\VWHPV'() aviation and marine refueling solutions. Fuel polishing and bulk metering systems. Vehicle wash systems, K-9 pet washes. Today Oberto provides innovative delicious, healthy and convenient protein-packed snacks under the Oberto & Cattleman's brands. Old Dutch Foods manufactures and distributes a full line of innovative quality chips and snacks. PAB wholesale has been providing exceptional service and products to retailers in Canada for nearly 20 years. Our brands Smokestyle Meats and Homestyle sweets have become a staple for many retailers. Pagonis Live Bait Ltd. has been serving the North American bait industry for over 30 years. We strive to maintain quality, consistency and availability of our products to our customers worldwide. PECO CarWash Systems manufactures premium car wash systems. PECO has gained the reputation for providing high quality systems at a competitive price. The most HELPFUL brand in car washing! Peel Regional Police Crime Prevention Services will provide robbery, theft, gas-drive off & fraud prevention information as well as updated cannabis legislation and what retailers should know about selling cannabis. products. 3HWUR&OHDUSURYLGHVIXHOGLVSHQVHUĆ&#x201C;OWHUVDQGĆ&#x201C;OWUDWLRQDFFHVVRULHV for dispensing petroleum, ethanol, methanol and biodiesel blends at retail and commercial fuel sites. Petroleum service and construction contractor for retail, commercial, aviation and industrial. Ontario and Canada. Manufacturer of canopy fascia, building, and pylon signage. Design-builder of custom forecourt distribution panels. Complete electrical installation services and full signage rebrand project management. New remanufactured service station equipment, including environmental monitoring products, displays, keyboards, LED backlight, printers, valves, meters, mechanical computers, pulsers, sensors and foodservice products. 3URYLGLQJSXULĆ&#x201C;HGZDWHU	LFHIRUWKHFDUZDVK	FVWRUHLQGXVWU\ for over 25 years. Water Vending & Ice Vending 24/7. We are the North American exclusive importer of Pure Hemp DQG6PRNLQJEUDQGUROOLQJSDSHUVĆ&#x201C;OWHUVDQGDFFHVVRULHV2XU warehouse is located just outside of Toronto. Restaurant - Home of the original toasted sub. Distributor of paper washroom supplies, soap and hand sanitizer, store cleaning chemicals, food service packaging, straws and napkins. Race Pro Products Inc. 1131 216 S Arrowhead Avenue San Bernardino CA 92408 United States of America Toll Free: 1-800-657-4811 Fax: 800-655-9792 www.raceproproducts.com Race Pro Products. Core-Mark's national private label. Delivering economy, value, and quality to convenience stores across Canada. Power Pressure Systems Inc. provides sales, service, parts supplies & repairs for self serve, touchless, friction & conveyor washes. QuickStrip Energy. QuickStrip Sleep. QuickStrip Vitamin B12. QuickStrip Nicotine. Principal LED is the leader in manufacturing and delivering sign and lightning solutions to the sign industry. We pride ourselves on innovation and custom solutions. PurClean/ PurWater 415 3315 Orange Grove Avenue North Highlands CA 95660 United States of America Toll Free: 1-800-882-8854 www.pureclean.com Developing and delivering innovative water treatment solutions for the car wash industry since 1983, we are committed to engineering products that set the industry standard. Raymar has been in the industry for over 40 years. Specializing in building bulk plants and gas stations. We sell smoking and vaping accessories like rolling papers, smoking pipes and grinders. Revinmedia specializes in car wash media including: strategic marketing, graphic design and sign manufacturing. From concept to production and installation. For naturally effective cough and sore throat relief. It's the earth's goodness for your wellness. That's Ricola. Lower energy costs! Protect perishable inventory! Reduce heat gain and glare! Maximize advertising space! Roll-A-Shade has been a leading manufacturer of shading solutions for over 30 years. We service any location across Canada. Come visit us at booth 527 to learn more! North America's fastest growing coffee service has installed hundreds of units in convenience stores and gas stations through Ontario. To receive your free unit, see booth #705. Second Cup Coffee is a Canadian specialty coffee retailer operating approximately 300 cafĂŠs across the country. Scandinavian Tobacco Group 600-1000 de Serigny Longueuil QC J4K 5B1 Canada Phone: 450-677-1807 Machine-made cigars. SEM is a manufacturer of unattended payment and control solutions. Money changer, card/token vending machine, self- service prepaid/ debit/credit card payment system and pay station for car wash.
SIR Solutions provide retail businesses with point-of-sale and management software, customized services and equipment that evolve according to their business growth. Cottage Country, available from Scholtens Inc., is Canada's premium brand for the widest assortment of best-selling, everyday candies, nuts and trail mixes, all in one convenient program. SoBrite Technologies designs and manufactures water reclaim systems, spot-free water units, water softeners and proven car wash reclaim odor control systems. Since 1981, SSCS has been the leader in retail petroleum and FRQYHQLHQFHVWRUHEDFNRIÆ&#x201C;FHVRIWZDUHZLWKWKHÆ&#x201C;QHVWWUDLQLQJDQG support in the industry. Packaged candy, nuts, chocolate and snack. Sparkle Solutions distributes vended and OPL laundry equipment and card charging stations in Ontario and Canada wide. STI is laser focused on producing the highest quality, longest lasting belt conveyors available today. TFB & Associates Limited - distributor of Fisherman's Friend lozenges. Canada's premier supplier of quality meat snacks. Totally Canadian since 1992. Tommy Car Wash Systems has a 50-year history of bringing industry-changing innovations to market through a process of development, testing, and success in their corporate-owned operations. For more than 30 years, TMS has provided automated propane dispensing systems, turnkey automation solutions from skid fabrication to automation software and meter calibration. Upwardor is a leading Canadian manufacturer of overhead doors for commercial & residential applications. We specialize in the manufacturing of a full range of sectional garage doors for the commercial and residential markets as well as a pneumatic door operator, called POWAIRDOR, and a newly expanded high-end residential offering. Three Farmers brings you healthy roasted pulse snacks, roasted chickpeas, lentils, pea pops grown and made in Canada. These don't just taste great, they are good for you. Bay 1, 2915 10th Avenue NE Calgary AB T2A 5L4 Canada Phone: 483-255-2740 www.vhcoffeeservices.com Offering "Total Coffee Solutions" for your c- store needs including fully branded coffee programs with marketing POS, coffee-brewing equipment and premium coffee brands. Leaders in providing secured retailing solutions for the control & sale of high-value products. Real-time data analytics & powerful digital media platform. Security Roll Shutters manufactured in Calgary. Ideal for storefront, cabinet and counter. Manual spring or motor with locking and anti-pushup devices. Western Refrigeration & Beverage Equipment 1137 1232 - 36th Avenue NE Calgary AB T2E 6M8 Canada Phone: 403-250-9656 / Toll Free: 1-888-443-1946 www.wr.ca Canada's leading distributor of convenience store & beverage equipment since 1946. Exclusive distributor of Ice-O-Matic, Atosa, and Howard McCray products in Western Canada. Come see us at Booth 1133. Wex, Inc. 413 97 Darling Avenue South Portland ME 04106 United States of America Phone: 207-576-7690 www.wexinc.com The WEX Fleet Card can help save on fuel costs each year, while reducing risk of fraud and easing administrative hassles. Weston Foods is a leading North American bakery company with a specialized focus across all key bakery categories. Distributor for Containment Solutions FRP Tank, Wayne, FE Petro, Incon, OPW, Bulloch, Benecor DEF equipment, LSI Lighting, Piusi and Ameron FRP Pipe. Tyson Foods Canada is introducing Hot `n' Ready individually wrapped P.M. Sandwiches. Stop by the booth and try one cheeseburger, southern fried chicken or BBQ pork rib. vGas: self-service & cardlock solutions. vPOS: 100% iPOS compatible mobile POS. ZoomLock: mobile card-lock app. ZoomWash: mobile car-wash app. Wwwash Canada 133 3615 Sierra Morena Road SW Calgary AB T3H 3A7 Canada Phone: 639-471-4990 / Toll Free: 1-833-927-4277 www.wwwash.com @WwwashCanada Wwwash is a mobile app for self-serve & automatic car washes with all the features of pay station straight from users' smartphones. :DVK/LQNVLVDFHUWLĆ&#x201C;HGGLVWULEXWRURI6211< 6WKHODUJHVWPDQXfacturer of conveyorized car wash equipment in the world. Better, faster, safer ... for less. Zep Vehicle Care takes an innovative approach to our products and programs, all with the intent to maximize the ROI of your car wash.
Increase your profits, traffic, and repeat customers with a new 24/7 Purified Water or NEW Purified Ice Vending Machine. We offer a full range of water and ice vending machines that generate high profits, increase traffic and repeat customers. We specialize in water treatment, water purification, water vending and ice vending equipment. We also offer parts, supplies and service for most makes. Coming to Canada! Increase car wash uptime, productivity and revenue with advanced point-ofsale and tunnel solutions. Easily manage and report on multiple washes from a centralized platform. Maximize wash uptime and store personnel productivity by having us monitor your wash. We help you spend more time generating revenue and less time maintaining your wash.
A patented, pre-charged, disposable emergency mobile device charger that is actually good for the environment. With repurposed and refurbished batteries, biodegradable shell, weatherproof packaging and a 2 year shelf life. Every time a Chargetab is purchased, there is one less battery headed for landfills. There is no other product like Chargetab on the market. Chargetab plugs directly into your device without the need for any extra wires, giving you the convenience of battery life anytime, anywhere. Charge your phone, save the planet! Whether you are looking for touch free or soft touch for your automatic bay, Oasis Car Wash Systems offers an in-bay automatic perfect for your site. With the highest throughput and dependability in the industry Oasis and its distributor network is a preferred partner. With MyWash Pass, unattended car washes can now offer unlimited wash programs. Contact us for details. It’s impossible to keep your eyes on your business 24/7. That’s why ADT Interactive for Business is the best solution for you—remote business security and wireless control allow you to monitor your business at any time, from any location. ADT Interactive Solutions is a user-friendly web management platform that ties intrusion detection and access control into one integrated system—so you can run a safer, more efficient business. Try our Newest 4 Step Paint Sealant Process, Molten Shield today! * Unique Flash Frozen Ice Cream kernels * Rich & Creamy Premium Ice Cream, no Ice Milk or substitutes * Made in Canada with Canadian dairy * Loved by all age groups * Low wholesale cost + high popularity = Great Profit Potential * New customer incentives Join the Mini Melts team today! Cardtronics is Canada’s largest and most capable ATM operator. We bring together unmatched global scale with local service and support to provide Canadian businesses with the best available ATM solutions. The revolutionary folding door from Finland is now in North America. For more than 30 years and more than 30,000 installs in Europe and North America, the FINDOOR has almost no maintenance, is low cost and weather proof. Carter Wash Systems Is a locally owned Canadian based car wash service/ sales company. We offer repair services, preventive maintenance programs and car wash inspections to both our corporate and independent customers. We specialize in not just in-bay automatic car washes but all types of washes as well. canadiancarwash.ca/search http://canadiancarwash.ca/search on the CCA website has close to a thousand member sites on it. Is your carwash listed? Member sites are listed for free, so contact office@canadiancarwash.ca for more information. The CCA For Sale website feature offers carwash operators a place to find a new carwash to purchase or to sell a carwash. There are three current excellent investment opportunities available online. Looking to SeLL or Buy a CarwaSh? Sonny’S iS CoMing to CanaDa with its highly successful CarWash College. With 3-days of hands-on training, graduates of this program return to their washes with the knowledge, and confidence, to repair sixty-seven (67) of the most common equipment, and their components, failures. With proper preventive maintenance, car wash equipment is inherently reliable, but no amount of maintenance can completely eliminate the possibility of a component failing. Being able to react quickly to the inevitable equipment malfunctions provides owners/operators with peace of mind. And aren’t there enough distractions on any given day without adding more? This program is an investment that delivers results – time savings – revenue savings – a better product – a better bottom line. Registration details and location information is available on the CCA website. With Vubiz, create a better work environment for your employees and brush up on your leadership skills! Explore an impressive library of free online courses in health and safety, growing your business, compliance, and more. These courses cost over $2000 per employee - but they’re free for CFIB/CCA members! 07	Editor’s Message Elusive. Desirable. Millennials! with the NEW Coffee Crisp Thins, NEW Kit Kat Chunky Salted Caramel Fudge Bars and NEW Smarties King Size Share Pack. Elusive. Desirable. Millennials! Everyone wants them, but who really understands them, and how do you appeal to these influencers born between 1980 and 2000? That's the question all retailers – from boutiques to mass merchants – are grappling with. Not since the days when the Baby Boomers reigned supreme has so much attention been focused on a single population segment. per household across FMCG categories is less than the $685 for Baby Boomers (source: Nielsen Homescan), Millennials are expected to exert more purchasing power in the near future. But they are not shopping in traditional ways, by visiting bricks and mortar stores. According to the "Millennials on Millennials" report: "In the last year, Millennials have not only contributed to, but have driven trip declines in Canada. Millennials’ rate of decline in trips per household was approximately twice that of the overall Canadian population. In addition, Millennials make 43 fewer trips than the average Canadian household on an annual basis." The silver lining is that though they shop less frequently at stores, they spend more per trip when they do shop. Their channel of choice remains the grocery store, but Millennials are also users of alternative channels. And, according to Nielsen, they tend to prefer dollar, drug and convenience stores more than the average shopper. That's good news for c-retailers with their eye on the prize who know how to "touch" these younger customers. I hope you'll find both useful information and inspiration in this issue's features to help you capture the Millennial dollar. CONVENIENCE STORE NEWS CANADA / OCTANE is published 6 times a year by EnsembleIQ. CONVENIENCE STORE NEWS CANADA / OCTANE is circulated to managers, buyers and professionals working in Canada’s convenience, gas and wash channel. Please direct inquiries to the editorial offices. Contributions of articles, photographs and industry information are welcome, but cannot be acknowledged or returned. ©2019 All rights reserved. No part of this publication may be reproduced in any form, including photocopying and electronic retrieval/retransmission, without the permission of the publisher. are made from the best ingredients we could get our hands on and slow-smoked to be pint-sized perfections. Introducing...CICC The Convenience Industry Council of Canada (CICC), which launched recently, is a national organization replacing NACDA and representing the interests of retailers, wholesale distributors and manufacturers. Look for a new website soon as well as information on the convenience summit in September. And look for our interview with CICC president and CEO Anne Kothawala in a coming issue of Convenience Store News Canada. Cannabis not in Ontario c-stores Ontario has rolled out its new rules for shops looking to sell cannabis. C-stores will not be among those most interested. The provincial government requirements call for cannabis stores to be standalone enterprises, which rules out traditional convenience stores. In addition, stores that sell pot cannot be within 150 metres of a school. Thwarting would-be robbers Circle K is using a simple – but highly effective – approach to deter thieves. The initiative, called Clear Zone, starts with the removal of posters from windows in front of a cash register to deter thieves and give workers a greater sense of security. The approach has paid off. Robberies in Circle K stores are down 18% in Ontario’s Peel Region, where the initiative first rolled out, and crime in some high-risk areas has plummeted to zero. A kit is available for store owners and employees, and the program is now gaining ground beyond Circle K and Ontario. Bank on this Parkland Fuel Corporation has added 280 ATMs to its agreement with Cardtronics Canada – more than doubling the number of ATMs under management. The number of ATMs, located in select Corner Store, FasGas, and Pioneer stores across the country, will jump from 206 to 486 and display the name of the TD Bank Group. On the other hand Automated teller machines appeal to more than customers looking for quick cash. Thieves also like ATMs, a reality that has led Ontario's provincial police force to urge c-store owners to rethink offering them as a service. According to the force, ATMs cost stores about $1,000, but theft of a machine can cost owners much more. Food purchasers prefer people The demand for online products and services does not appear to include food, according to a new survey from Dalhousie University. The Grocery Experience National Survey Report found that almost 50% of Canadians do not intend to purchase food online and younger Canadians prefer to shop at food stores where they know people who work there. As well, 81.7% of Canadians believe it is important to be able to ask for some assistance if needed when buying food. The Nova Scotia government has accepted recommendations from the Nova Scotia Minimum Wage Review Committee to increase the hourly rate for each of the next three years. The minimum wage will rise by approximately $0.55 annually and effective April 1, 2022, the rate be adjusted with inflation. There is good news for c-stores in the Ontario government’s most recent Economic Outlook and Fiscal Review, which says it is putting “consumers first by providing more choice and convenience.” That promise is likely to translate into the expansion of beer and wine to corner, grocery, and big-box stores. Timing to be determined. Sip on this Following the death of a young girl in Quebec, Health Canada is moving to amend food and drug regulations to reduce the amount of alcohol in premixed sugary drinks sold in single cans and often popular with young people. Under the proposed changes, containers under one litre will provide no more than 1.5 servings and the alcohol content will be restricted to 25.6 ml. YOU’VE HAD MILK, WHITE & DARK. Introducing NEW HERSHEY’S GOLD, a velvety creme with a hint of caramel, combined with crunchy, salty favourites like peanuts and pretzels. It’s a delicious new way to experience Hershey. GOLD starts with a smooth creme slowly heated to a light golden brown to deliver a caramelized and buttery-sweet flavour. You’ve had milk, white and dark flavours – now it’s time for GOLD. COME SEE US AT BOOTH #920! What's ahead in the next 10 years? There’s little consensus when it comes to Millennials. They have been described equally in negative and positive terms: entitled - fearless; hyper-qualified - unambitious; empathetic - impatient; community-minded - self-centred; tech savvy - tech-blinded. But definitely woke. It’s a challenge to even get agreement on how to bracket the group demographically – when it starts and ends. Deferring to the recently published, “Millennials on Millennials” by Nielsen Canada, the Canadian Millennial generation is defined as individuals born between 1980 and 2000. That makes them currently 18 to 38 years old (Exhibit 1). Data Points Looking at the numbers, it’s clear that Millennials are a work in progress. They haven’t yet reached their maturity in terms of consumption potential. Millennials, as defined by Nielsen, represent over 27% of the population. However, they’re only 16% of household heads, and Millennial households spend an average of about $509 per household per month across Fast Moving Consumer Goods (FMCG) categories, compared to $685 for the Boomer generation. All told, Millennial households account for just 12% of overall FMCG dollars spent (Exhibit 2). Part of what’s tricky with Millennials is they don’t conform to traditional habitation patterns. That makes them tougher to pin down. Nielsen looked deeper at Millennials via its Account Shopper Profile survey and found that Millennials living in their familial home or with an older relative, for example, may not be the recognized head of the house, but could still be the de facto person responsible for most of the shopping. Defining “primary shoppers” as those who make over 50% of their household purchase decisions, Nielsen’s research found that 23% of all Canadian primary shoppers identify as Millennials. That’s a valuable insight, and a big number – nearly one-quarter of the retail market. And Millennials’ influence will only grow over time. Finding their Legs According to a study from the Princeton, N.J.-based Educational Testing Service, Canada has the world’s third-highest level of post-secondary educational attainment. Close to 60% of Canadian Millennials over the age of 24 have some sort of education past high school – only South Korea and Japan have a higher percentage. The economic data confirm that Canadian Millennials have, as yet, struggled to translate educational achievement into economic advantage. However, the numbers are starting to turn in their favour. With Boomers semi- and fully exiting the workforce with increasing frequency, space on the board is starting to clear for Millennials. At the same time, the number of Millennials living at home is falling. As their earning power rises, Millennials are feeling that their financial well-being is on the uptick (Exhibit 3). Millennial Shopper Preferences Cracking the code – or figuring the “life hack” – on Millennials is key. They are economically important to your business, that's a given. Knowing how to monetize this opportunity is entirely another story. The metrics show that Millennials index significantly higher than other consumer groups when it comes to their preference for convenience, dollar, and drug stores – reporting more than double the average channel preference for c-stores. One explanation for this is that Millennials often express, in their value hierarchy, a priority for “freedom before money.” This tendency to favour impulse over convention translates into the pursuit of work flexibility, freedom to travel, and life enjoyment. It’s also one of many windows into how to be in synch with this group. A New Normal for C-Stores? What will the impact of the Millennials be circa 2030? Imagine a day, sometime in the future when Millennial preferences and dietary habits have revolutionized the c-store channel. In my own household, there are, at any given point in time, anywhere from one to four 20-something-year-old Millennials under our familial roof. It’s been this way for the last five years or so, and, as strange as it can seem at times to the titular heads of the household, it’s the most natural thing in the world for our Millennials. •	Full-service coffee bar •	Fresh produce from local farms •	Small batch local brands •	Bulk bin products Causeway Convenience, in Queen Charlotte, BC, represents one such new wave convenience store. In addition to typical c-store items such as groceries, treats, coffee and slushies, Causeway offers a growing line of fresh local products and health food, including organic, vegan and gluten-free products. Darren Climans is a foodservice insights professional with close to 20 years' experience partnering with broadline distributors, CPG suppliers, and foodservice operators. His practice is to understand issue-based decisions by taking a data-driven approach to strategic decision making. Extended time in the nest before departing, or boomeranging back intermittently for extended stretches as required, is seen by them and their cohort to be a function of economic pragmatism. And the fact that this arrangement affords them the opportunity to spend a disproportionate share of their discretionary income on leisure, hospitality, life experiences, and convenience is a welcome perk rather than a concern. If you’re positing what this could even look like, then wonder no more. The future has already arrived in the form of independents, regional chains, and multinational c-store operators like 7-Eleven acting now to catch this wave as it is rising. All exhibits | Source: Nielsen Canada, May 2018, Millennials on Millennials – Why We Matter. Savvy convenience retailers create vibrant online communities We’ve seen remarkable change in our lifetimes, but what we’re experiencing now is different. It’s not just evolutionary change; it’s transformative change that requires us to alter our patterns of behaviour and learn new skills. Just having a nice store with nice products and services in a good location isn't enough anymore. Consumers are seeking modern conveniences such as mobile apps that can connect them directly with their stores, and you must be willing and able to meet those needs. Although specific apps may not be feasible for certain c-stores, the likelihood that your customers are already using social media is high. With social media establishing itself as a viable online marketing opportunity, how can you use technology to promote your store and its products and services? It’s time to get social The most important point about social media is that it’s a marketing channel not a standalone marketing strategy. Your online marketing objectives should include aiming to grow your business, convert shoppers, educate your shoppers and/or engage your shoppers with a social media plan that offers visibility and connection as well as convenience. The result can be time and money-related savings of your scarce resources for marketing, as well as increased customer loyalty. Social media allows you to connect with your loyal customers on another, deeper level. Are you considering using or enhancing your social media to promote your business in 2019? Find your audience This phrase is used a lot when discussing social media marketing. And it sounds intuitive, right? You must find the people who will want your offerings and target efforts towards them. But putting this phrase into practice can be a bit daunting. You might be asking yourself: Where is my audience? How do I find them? The first step to answering this question is simple. You must understand the environment of each social media platform. Not only does the type of communication available on each platform differ, but the expectations for communication differ as well. Schedule content as you discover it Creating an effective social media plan can be overwhelming and time-consuming, but by staying organized and planning as much in advance as possible, you can manage all your social media in one place by using a dashboard service for posting. Both Hootsuite and Buffer offer free or paid options. On a free version they each allow up to three social sites to post to, and on a paid basis there are plans to suit your needs. If you’re at an early stage the best strategy to begin is to use both as a free service; that way you’ve got six sites you can post to. Then measure the impact of your social media campaigns through comprehensive reporting. Both dashboard services come with robust analytics to help you get the most from your activity. It’s easy to set up, but maintenance can be complicated, so your store should be running well before getting involved in social media because it needs to be consistent and maintained to be effective. Cleanliness is key, both inside and outside your location. If you have a fuel offering, the pumps will need regular attention. Emptying trash cans, sweeping up unwanted debris and maintaining equipment should become standard part of yours or your staff's routine, and schedules should be created to ensure things aren’t missed. Innovative and seasonal exterior products help to make both the exterior look full and drive what can be a high margin category, when done well. For example, propane exchanges, firewood and ice all have a place in the exterior layout, and if there are seasonal factors, perhaps a featured position or specialty product is warranted. A well-lit location implies safety. Keep canopy lights, exterior signage and any specialty lighting fully lit. Having canopy letters or feature-lit sections that do not work, or work only partially, speaks volumes to the perceived service a customer will receive. Full merchandisers reinforce your commitment to provide customers with both selection and price choices. Keep the washer-fluid, firewood, ice, etc. fully stocked and ready to sell. Brush off excess snow and keep your products as visible as possible in off-season. while positioning exterior categories to help keep the overall store looking open and inviting, plus adding an extra level of safety. Don't forget your outdoor space. Retailers & Distributors Manufacturers Industry Associations and Industry Luminaries Solution Providers and Consultants The 2019 winners will be recognized across our digital platforms, featured in our July/August edition of Convenience Store News Canada magazine, and recognized at our inaugural Awards Ceremony this Fall. Stay tuned for event details in an upcoming issue. Pour powder over gummies or ﬁll up the compartment to dip! Digital disruption and seismic population shifts are upon us, and Millennials are at the helm of these changes. This generation is quite literally the future, but understanding and harnessing their purchasing power can be a daunting task. Despite making fewer trips on average, Millennials are likely to spend more than other cohorts per occasion. This is where the opportunity lies. While the number of trips Millennials made declined by 5% in the last year, the amount they spent per household grew by 4%. Compared with the total Canadian population and the Boomer generation specifically, Millennials tend to shop less frequently but spend more per trip. In fact, Millennials spent just over $7 more per trip than the average Canadian household and close to $11 more than Boomer households in the last year.1 Millennials with kids make more trips to the store than their counterparts without kids. But basket size, or the amount they spend during those trips, also differentiates these two groups of Millennials. Regardless, declining traffic is an issue that all Millennials are driving. Time, convenience and life stage all play a role in challenging Millennials’ trip rates. In order to drive trips among Millennials as a cohort, manufacturers and retailers should view store traffic as a task worth actioning across all Millennial homes, regardless of whether children are in the mix. Knowing that Millennials with kids spend substantially more per trip than Millennials without kids, there lies an opportunity to identify and capitalize on where and what this consumer group is spending the most on. PREFERRED STORE ALTERNATIVES Millennials are more likely to select a store based on the availability of best everyday prices and product selection. In line with previous generations, Millennials are creatures of habit. They are just as likely as any to prefer shopping at their “usual stores.” However, what Millennials define as their “usual stores” may be different from other generations. For example, in addition to mass merchandisers, Millennials tend to prefer dollar, drug and convenience stores more than the average shopper. THE AGE OF ONLINE Millennials show a greater propensity toward online shopping for FMCG categories than other generations. This spans both online shopping with home delivery (14% of Millennials) and with pick-up at a designated location (9% of Millennials). Across both online fulfillment methods, consideration of online shopping decreases with age. This inclination to shop online is being fueled in part by Millennials' desire to spend less, with approximately 15% of Millennials claiming to shop more online as a means of cutting costs.2 Ultimately, digital is upon us, and while in the past the online and offline worlds have been viewed separately, and often in competing ways, it’s becoming more and more relevant to think of the two as complementary and connected. However, it’s important to understand that the consideration of a channel does not necessarily translate into secured and repeated purchases within it. Therefore, it is vital for manufacturers and retailers who choose to develop their online presence, to focus on the conversion of shoppers from “considering” to “preferring” to shop online. Compared to the rest of Canada, Millennials are nearly twice as likely to use digital tools to influence their FMCG purchases.3 Understanding the e-commerce assets you possess today and offering an inviting online shopping experience will be essential to future success. SHOPPER INFLUENCERS The Millennial path-to-purchase is not linear. Instead, there are many consumer touchpoints that manufacturers and retailers can use to trigger a Millennial purchase. Therefore, having a comprehensive understanding of the Millennial shopper experience, both pre-store and in-store, remains vital. DON’T FORGET Millennials Rely On In-Store Reminders Though Millennials plan the majority (64%) of their category purchases before they enter a store, these consumers are more likely to rely on instore reminders as a means of completing their shopping list compared to the average Canadian household. With approximately 20% of all Millennial category purchases triggered by in-store reminders—versus 9% of all Boomer purchases—marketers should tailor their in-store marketing efforts to attract this younger cohort who may not have it all written down. Millennials are more likely to have the above categories in their basket on any given trip, over other categories available in-store on % of $ Over-indexed $ total dollars spent on this category over the year vs. Boomers Source: Nielsen Canada, Category Shopping Fundamentals, 2017, (n=127,972, n=28,428, n=61,794) Read as: 20% of FMCG category purchases made by Millennials were needed or wanted, but only remembered once in-store. Index value can be read as: Millennials are 43% more likely than average to make an FMCG purchase based on a reminder. ENGAGING WITH MILLENNIALS IN-STORE Millennials are less likely than other cohorts to shop on auto-pilot, or to purchase their usual products without considering other options in-store. In fact, across total store purchases, Millennials indicated that they buy products on auto-pilot 42% of the time, versus Boomers at 49%. Ultimately, because Millennials tend to be engaged shoppers, meaning they pay attention to the products and messaging found in aisles, there are more opportunities to interrupt the Millennial path-to-purchase in-store than there are among other cohorts. How these shoppers are browsing shelf sets, price checking and/or seeking advice and reviews online only emphasizes the importance of in-store interruption points and means by which manufacturers and retailers can trigger purchases among this group. Manik Dhir, owner, Hollywood Market in Kelowna B.C. For more than three decades, Hollywood Market in Kelowna has welcomed customers through its doors in the heart of British Columbia’s Okanagan Valley. “This is a landmark establishment in the community. People know this place,” says owner Manik Dhir. Until recently, however, the store was struggling to be a vibrant and central part of the community of roughly 127,000. That struggle ended when Dhir purchased the store almost seven years ago and “brought it back to life.” The store needed an injection of new ideas and new energy, he says. ers also inquired about nine-grain bread. This now sits next to the whole wheat on store shelves. standard for c-stores in Canada. That employee satisfaction leads to better customer service. It’s a policy that has translated into more than 400 likes on Facebook, a social media outlet Dhir uses regularly to reach his customers and connect with the community at large. It’s also an opportunity to have a little fun, while being informative. Over the holidays, for instance, the retailer posted a notice in the style of the British motivational poster: His version read (and red): "Keep Calm. We’re Open Christmas Eve." Snapshot Opened: Originally opened in the 1980s as a delicatessen before being transformed into a c-store. Location: 544 Hollywood Rd. S., Kelowna, B.C. Eclectic items: Everything from JUUL e-cigarettes in five flavours to freshly made butter chicken to AriZona Grapeade. Hollywood Market's top tips: Listen to your customers. Pay close attention to their requests and see how these fit with your business model. Customers who feel valued are repeat customers. Invest in your staff. This will lead to better service, higher retention and greater satisfaction among employees and customers. Great frontline service starts here. Know your business. Learning about your competition and their product offerings, and understanding how your business compares will lead to success. Knowing your business also requires understanding how the sector is evolving, and the best way to do that is to get involved in your industry. NOT FOR SALE TO MINORS This is an age-restricted product and age verification is required at sale. * Source: Nielsen’s U.S. Convenience Store + xAOC channel, 4-week ending 7/14/18 © 2018 JUUL Labs, Inc. ALL RIGHTS RESERVED. But he’s a wizard when it comes to zigzagging through the challenges of running three winter-dependent stores at the foot of Mont-Sainte-Anne, the largest ski resort in Eastern Canada, all called Marché Mont-Ste-Anne. “We’re like ski shops and other seasonal operators,” says Royer. “If there’s no snow, we’re in trouble.” Tourists, he adds, make up roughly two-thirds of total store revenues. Nearly three-quarters of those sales happen during peak ski season from December to March. It’s been that way since 1992 when Royer and fellow entrepreneur and majority partner Denis Hamelin bought their first c-store near Mont-SainteAnne, 50 kilometres northeast of Quebec City. “ It was more of a general store with a post office and a meat counter,” recalls Royer. They did a costly makeover of the store, bringing in new refrigerators and counters and investing in ski-themed wall art and other decorations. They also introduced bar code scanners, reportedly becoming the first food store in the Quebec City region – and possibly all of Quebec – to use the technology. A year later, the partners opened a second store in the lobby of the Chateau Mont-Sainte-Anne, a four-star hotel at the base of the ski mountain. “It was more of a souvenir store with stuff like sweat shirts with the MontSainte-Anne logo on them, postcards with winter scenes, and pop, chips and chocolate bars,” says Royer. “What I love most about this business is meeting and talking with people from all over the world” in 1995 in a small strip mall that Hamelin built just a kilometre west of MontSainte-Anne. Hamelin takes care of his other businesses, including a restaurant and ski shop next door. According to Royer, the new location was designed from the outset to meet growing demand from both tourists and locals for everything from fresh-baked goods, charcuterie items and movie videos to specialty foods, craft beers and outdoor vacation-related items. delicious options they’ll love in both AM and PM. Individually wrapped sandwiches deliver added convenience for your on-the-go customers. Alain Royer's top tips: Know your regulars. “People like to be called by their names. Get to know their names, even their wives' and kids' names.” Stay cool. “Staff can and do make mistakes, especially when they’re young and inexperienced. Don’t blast them when they screw up; don’t be dramatic. Keep calm and be constructive." Compliment staff. “It’s easy to be critical, but it’s important to also be encouraging and to tell staff the things they do right.”. • Faubourg (most easterly) • Chateau (in the middle) • Plateau (the biggest, most westerly and the only one with a gas station). Store hours: Daily from 7 a.m. to 11 p.m. Open 365 days a year – though they close at 8 p.m. on Christmas Day! One of his hottest items is icy cold. He’s recently brought in the Toronto-based Death in Venice line of gelato flavours, including Sour Cherry, Turkish Coffee, Ricotta Rosemary and Blueberry Lavender. “It’s a good fit since we are also a sit-down café,” explains Szanyi. Fresh brewed coffees, including traditional blends as well as intriguing varieties like Tumeric Revival, Matcha Latte, and Café Mocha (with cocoa, espresso, coconut whip and cinnamon). A big draw at PopBox is its racks of cold press juices, sourced locally from the Village Juicery. “It’s organic and full of beneficial ingredients,” enthuses Szanyi. The “Be Well Juice” contains kale, celery, green granny apple, parsley and others; “Be Nourished” includes gala apple, kale, cucumber and swiss chard; and “Be Radiant” offers carrot, sweet potato, lemon, fresh turmeric root, and more. There’s also the organic beverage Kombucha supplied by Rise in Montreal, heralding restorative benefits in its top flavours like Ginger; Mint and Chlorophyll; Lemongrass; and Hibiscus and Rosehips. Climate-controlled coolers are filled with gastronomic frozen dinners, meat pies (such as pulled pork, butter chicken, and chicken, cheddar and bacon mash), and a line of hand-made wraps, including fresh Turkey Chorizo & Egg Breakfast Wrap and Almond Thai Chicken Wrap, prepared by Foodbenders of Toronto. There’s also a slice of decadence newly introduced on the PopBox menu. Szanyi has inked a deal with The Cheesecake Factory, the U.S.-based pastry potentate, to carry some of its more popular delicacies, including wedges of white chocolate and raspberry cheesecake, Godiva Chocolate Cake, Blackout Cupcakes, and the Ultimate Red Velvet Cake (with cream cheese frosting). A sweet acquisition for the store’s java junkies, according to the store owner. PopBox has continued to evolve since opening its doors in 2015, bringing on board many features that have clicked with customers, and disposed of those that didn’t. Szanyi points out that his vision for PopBox is nothing less than the reinvention of the corner store. “I like making ideas come to life,” he enthuses, adding that testing those ideas on a daily stream of customers who walk into his store allows him (and his staff of eight) to turn on a dime to the ever-changing whims of the upmarket crowd. “It's a constant process of trial and error through a commitment to innovation,” he says. Product mix: a thoughtful and funky blend of the basics with carefully curated gourmet lines, many of them sourced local. Snapshot Pricing: premium products = premium pricing. Owner Attila Szanyi is looking to compete on innovation, not price. Change the product mix occasionally to keep your customers interested in coming back. Use good design and constant cleanliness to create perceived value for your product (i.e. increased margins) Try to anticipate the needs of your customers before they even have a chance to articulate it. Treat your employees as invested members of the team. The commitment you get from them in return is your greatest operational asset. 25% oﬀ your ﬁrst order! Beaudry & Cadrin Inc. Ben Deshaies Inc. Consultants de L’Arctique Distribution Regitan F. Charest Ltée. Roland et Frères Ltée. Beech Brothers Ltd. Campbellford Wholesale Co. Ltd. Courtney’s Distributing Inc. Falls Wholesale Ltd. Farquhar Massey Wholesale Ltd. Fortier Beverages Ltd. Hyde’s Distribution J.N. Webb & Sons Ltd. Loudon Bros. Ltd. Ritchie’s Wholesale Ltd. Wallace & Carey Inc.
embracing what consumers value the most will lead to better product decision-making and more targeted innovation in the salty snack category that will still allow Canadian consumers to enjoy their favourite treats. So, what makes a snack healthy? According to a recent survey, 54% of consumers are looking for more fruits and vegetables. Consumers are also mindful of moderating how much of certain ingredients are in the products they buy: 49% are looking for products with less sugar, 32% seek out less salt, 23% are drawn to small portions (23%), and 27% are driven by the presence of natural ingredients. With nearly one-third of consumers seeking less salt, now is a good time for manufacturers of salty snack products to look into their innovation pipeline and ensure there are products in the offing that will meet these consumer needs. In addition, Canadian consumers are increasingly mindful of avoiding ingredients they deem undesirable. And across the spectrum of ingredients that consumers are seeking to avoid, one word prevails: "artificial." Artificial sweeteners, preservatives, flavours, and colours all make the top 10 of ingredients we want less of in the foods and beverages we consume. So, while consumers are seeking less salt, salt is not the most important factor when considering the purchase of snack products. on emerging health and wellness trends. As diets change, they influence the way consumers eat, what they buy and where they buy it, which makes it imperative to understand consumer preferences and demands. This, in turn, will result in more targeted marketing and sales efforts. As well, with most categories, one size does not fit all when it comes to snacking. Consumers across Canada have individual shopping preferences, and retailers should stock their shelves accordingly. And while consumers love to snack, snacking preferences will likely continue to evolve. Staying in tune with regional, as well as more global snacking trends will help ensure manufacturers and retailers are providing the right products to the right consumers at the right time. ◗ Isabel Morales is the manager, consumer consumer insights insights for Nielsen for Nielsen Canada. We've quoted you as saying: "What Millennials want from convenience stores is a group of products that you can’t get elsewhere right away. Consumers ask themselves, 'Why should I step in your store?" What would encourage Millennials to shop c-stores over other retailers? What are Millennials looking for in their shopping experience? Why should they step into c-retailers' stores? Like most shoppers, Millennials are looking for convenience first and foremost. Do you carry the products I need, at a reasonable price, in a conveniently accessible way? The challenge for c-stores is that other retailers have stepped into their convenience space and battled on that terrain. So, to compete, c-stores need to increasingly think of the customer experience. How do c-stores fit into the typical lives of a customer today? Do you personally ever shop in c-stores? From time to time I do. Usually starts with gas but I also have run out to the local c-store to pick up milk on a holiday, to get a lottery ticket, or pick up some drinks for mixing before a get-together. But there’s little that a c-store offers me that’s unique to that store. They don’t offer anything I need or want that I can’t get somewhere else – except for gas. What retail trends specifically related to the Millennial shopper should c-store operators be aware of in 2019 - and beyond? Increasingly, consumers are shopping with their emotions and Millennials are at the forefront of this trend. Consider the recent Gillette ad or how political brands like Nike and Starbucks have become. This is a challenge for c-stores whose primary value to a consumer is convenience, which serves a functional need rather than an emotional one. As c-stores think about responding to these forces, I always recommend asking yourself – what does it say about your customers that they come to your store? Is there a personal touch you can offer? Are they helping to support a local business? Are you making their lives easier and more convenient? More than ever, I think businesses, especially in retail, need to have a story and start telling it where Millennial consumers are. You've also said in our magazine: "... successful convenience stores deliver a differentiated offering from other food and beverage retailers such as grocery stores, in that they are often open 24 hours, setting themselves apart by providing an on-demand, customized shopping experience." David Coletto is one of the founding partners and the CEO of Abacus Data. Himself a Millennial, Coletto leads Abacus Data’s Canadian Millennial Research Practice, developed to help clients connect and engage with Canadian Millennials. He regularly studies Millennials' shopping preferences and has a few cautionary words for convenience operators.